Friends of astronomy in Las Cruces organized a friendly “Pluto Protest” Friday on the NMSU campus. 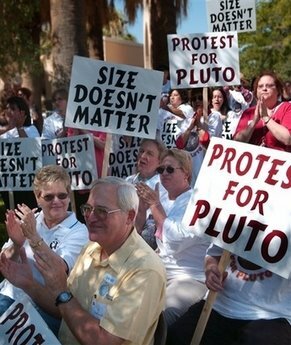 The protest was directed against the “official” demotion of Pluto to a non-planet. Las Cruces has a very direct interest in Pluto. Clyde Tombaugh, who discovered the planet on February 18, 1930, joined the NMSU faculty in 1955. His legacy in astronomy, and in astronomy in this area, is monumental. Patsy Tombaugh, 93, Clyde’s widow joined the protest.